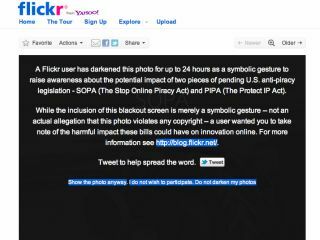 Over 250,000 photographs hosted on Flickr have been darkened by members for 24 hours, in order to help raise awareness of PIPA ('Protect IP Act') and SOPA ('Stop Online Piracy Act') being considered in the US Congress. The move follows the likes of Wikipedia and Reddit pulling the plug on their sites on 18 January, in protest of the proposed online anti-piracy legislation. In a blog post by Flickr's Senior Community Manager, Zack Sheppard it was announced that the team behind the photo-sharing site "believe that these bills miss the mark". "Flickr is letting members darken their photos — or the photos of others — for a 24-hour period to deprive the web of the rich content that makes it thrive. Your symbolic act will help draw attention to this issue and let others know about the potential harmful impacts of these bills." Users who didn't want to participate in the blackout could opt out from any photo. The most recent tweet on the official Flickr Twitter stream indicates that 257,495 pictures had been darkened, and there had been over 1 million views of dark photos by the end of play on Wednesday. The final figure is likely to be confirmed today.